Elizabeth Warren, left, and Donald Trump. WASHINGTON — Elizabeth Warren was working on puzzles with her three grandchildren on a trip to Los Angeles last week when she checked her laptop and saw that Donald Trump had gone after her on Twitter. “I got a notice that he’d attacked me,” Warren said. “I laughed out loud,” Warren recalled when she saw the nickname. She sought out a quiet place to respond. “I left the kids and went to the other room and wrote the tweets,” Warren said. Thus began a highly unusual digital debate between two of the most prominent politicians in America. It stretched more than four hours — with Warren and Trump sparring in personal terms in near real time. She called him “a bully” who “spews insults and lies.” He called her a “fraud” who is “weak and ineffective” and “not Native American.” The two picked up where they left off on Wednesday with a new series of exchanges. The Trump vs. Warren tweets attracted massive amounts of news coverage and are a potent reminder of Warren’s ability to harness social media for a cause or a candidate. They thrust her back into the national political spotlight after months of being overshadowed by fellow progressive Bernie Sanders, who is also an able communicator on social media. Warren’s ability to effectively confront Trump — rare among politicians — is also fresh evidence of the edge she brings as a surrogate for the Democratic Party and the strength she could offer the national ticket, particularly given how Democratic front-runner Hillary Clinton’s campaign struggles to come across as authentic and is failing to connect with younger voters. Warren’s name has been floated as a potential vice president for Clinton, and even Vice President Joe Biden considered asking her to be on his ticket when he was thinking of mounting a bid last August. And though Warren has deep ideological differences with both Biden and Clinton, her willingness to engage so aggressively with Trump has been widely seen as an audition for the attack dog role usually filled by vice presidential candidates. 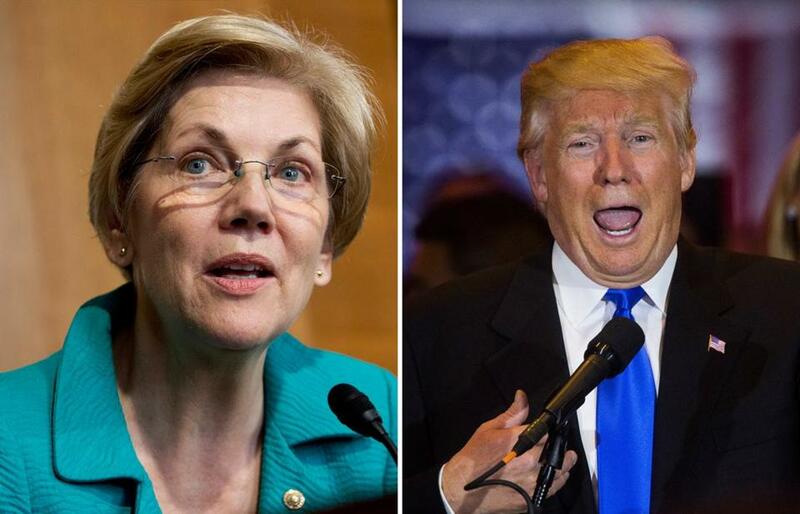 In some ways, both Warren and Trump benefit from the Twitter tussle. They each seem to relish the exchange, which has rallied both parties’ bases. Clinton’s campaign stays in touch with Warren’s camp on a regular basis. A Trump spokeswoman didn’t comment. Warren combines a measure of Internet-friendly snark with policy-heavy attacks that — so far — push back at his antics without making the mistake of overshooting, as some of his Republican primary opponents did. The most recent burst of exchanges began May 3. The US Senate was in recess for a Mother’s Day break, and Warren was in California visiting her daughter’s family. Warren and her family watched television together as Indiana primary results rolled in, seeing Trump prevail in 85 of the state’s 92 counties. Then, shortly after polls closed, word spread that Trump’s main competitor, Senator Ted Cruz of Texas, would drop out. These messages, some posted on Facebook and others on Twitter, were shared widely and viewed by more than 45 million people, Warren’s staff said. She has nearly 420,000 followers on her personal Twitter account. Trump didn’t respond until three days later, when Warren was again with her daughter’s young family. “I expected he’d punch back,” she said. 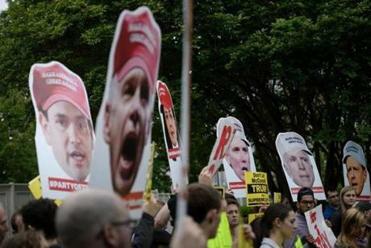 Trump, for his part, is relying on lines of attack used by former senator Scott Brown during the 2012 Brown vs. Warren campaign: The presumptive Republican nominee has called her “ineffective” and focuses on her unsubstantiated claims of Native American ancestry. They picked up again Wednesday with a series of exchanges. In fact, a scroll through Warren’s campaign Twitter feed shows that the only topics Warren has tweeted about this month are Donald Trump and the Republican primary. It’s all the more surprising given that Warren has yet to endorse in the Democratic race, which has stretched much further than anyone believed possible last year. Out of the 14 female Democrats in the US Senate, Warren is the only one who hasn’t yet endorsed Clinton. Warren is closer to Sanders on the big issues, including regulating Wall Street. But it’s not out of the question that she’d join with Clinton if asked. Nine months ago, Warren sat down with Biden as he was considering a presidential bid. Biden, like Clinton, has close ties to the financial services industry that Warren rails against — but she was open to being on the ticket with Biden. The vice president never officially offered Warren the job. But after the pair met last August in the lush quarters of the Naval Observatory, he asked Warren to look around.